Mothball is back and it’s Christmas time! She still sleeps, eats, scratches and sleeps some more but this time she goes on an unexpected sleigh ride! Mothball finds a perfect spot for a nap and unbeknown to her it’s at the base of Santa’s sleigh. She’s taken on their Christmas Eve adventure and even better, wherever they go there are carrots left out to eat! If you haven’t read any of the ‘Diary of a Wombat’ books – ‘Diary of a Wombat’, ‘Baby Wombat’s Day’ and ‘Baby Wombat’s Week’ – you should add them to your ‘Must Read’ list! I’ve read some of these books to classes of young children who are nearly doubled up with laughter at the end of the book! They seem to love Mothball’s cheeky attitude and her cuteness! 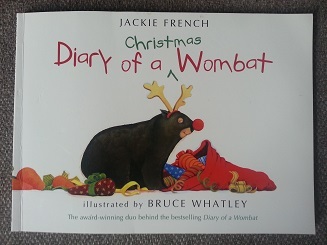 ‘Diary of a Christmas Wombat’ is a great book for both reading at home and school!